To read out the meaning of a word from its face by dissecting to its proper containing radicals and learning its decoding inference logic. 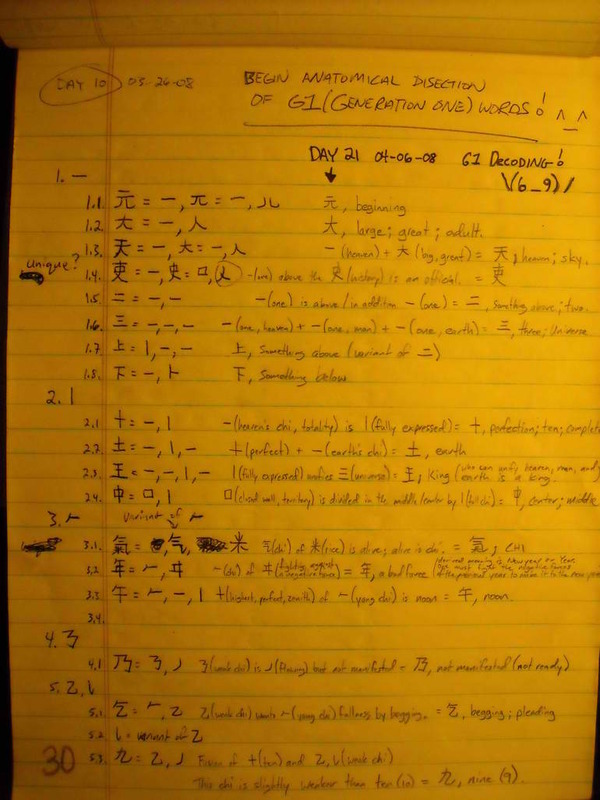 Return to Lesson One where we completed the Generation 1 (G1) dissection and decode each (G1) word’s meaning and correct any dissection mistakes that we can. I began Assignment 7 on April 6, 2008 and I completed Assignment 7 in only fourteen days on April 21, 2008. Note: The work I did on the following two days are outside the date range of this assignment: April 13, 2008 and April 15, 2008. The work I did for these two days are part of Assignment 8. G1 decoding was without a doubt the biggest hurdle in my learning race and I believe, thus far, was also my greatest accomplishment. There was the fact and frustration that initially I was not very good at decoding a word. I would see the root for “night” over the root for “mouth” and think “lullaby” when really it means “name”. Or I would see the root for “cow” over the root for “mouth” and think, yes of course, a “cow’s mouth” but in fact it means to “tell or sue”. I knew that there were sometimes cultural knowledge that played a role in the logic inference of some words, but I had yet to learn a great deal about the culture. 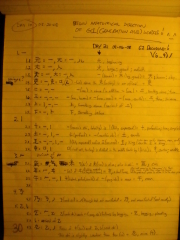 Also, I did not know at that time that the phonetics of a word could sometimes play a role in its logic inference. Although, it would not have assisted me too much considering that I was not learning any of the phonetics. 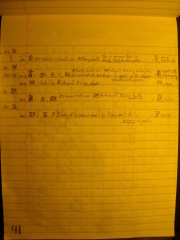 Another challenge was using the Chinese dictionary. It was not easy to use because I had to guess the leading radical for each word and my first, second, and third guesses were frequently wrong. I felt confident about my pen-strokes, yet I often still had difficulties locating certain words. Moreover, sometimes the dictionary did not even have English translation so I would have to continue to look up more words just to understand what it meant in regards to my first sought definition. But, I had to check my decoding to see how close I was to the modern usage or latest fashion of how a word is used so this was a tedious task I had to bear. Sometimes my decoding would hit the target but miss the bullseye, most of the time I was far off like the examples I stated above, and only very rarely was I ever completely right or had a more accurate definition than the dictionary. I learned very quickly that for a word there is an original meaning and then possibly many derived, extended, and even borrowed meanings. For example, the original meaning for the root “transformation” placed to the right of its mirror image is “two opposing forces back-to-back” but its extended meaning is “North”. This, too, was another obstacle to overcome. 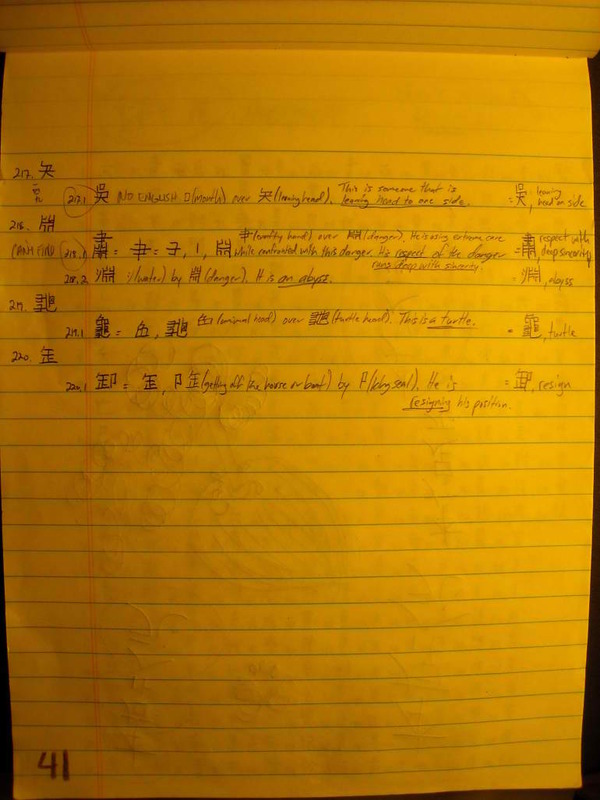 Truthfully, there were a couple times that I was so irritated that I had to change things up a little bit, and that is why there is a shift in my study pattern on the dates noted above (April 13, 2008 and April 15, 2008). I did come to terms though, I knew that I would have to press forward and get through it, so I did. I wrote the words and decoded them and even if my decoding was wrong or absurd I continued to attack each word one at a time. And then, very similar to my experience during the G1 dissection, something clicked and I just began to overcome the barriers. I became savvy with the dictionary to the point that I could almost simply open it directly to my sought word. My decoding was hitting that target and the bullseye more and more often. I was covering more ground much faster than I had when I began, and then before I knew it I had completed all the G1 words from the assignment! I was thrilled!